Celebrity chefs are all the rage, but which of them has the best restaurants in Chicago? Here are the 16 best celebrity chef restaurants, ranked. Where to have a sit-down meal with children in Chicago. When Little Goat Diner opened in 2012, everyone had been losing their sh*t over Girl & The Goat for two years. So naturally, people lost their minds over this place, too. And in that respect, not much has changed - this casual spot from the Girl & The Goat team is still really popular and busy. But another thing that hasn’t changed is the fact that the food is inconsistent: some things on the menu are delicious, but others are overly complicated to the point that they feel like Mad Libs you can eat. Not every place that calls itself a “diner” feels like one. Take Au Cheval, for instance - we can’t think of any other diners that look like dimly-lit dive bars and regularly have three-plus hour waits. 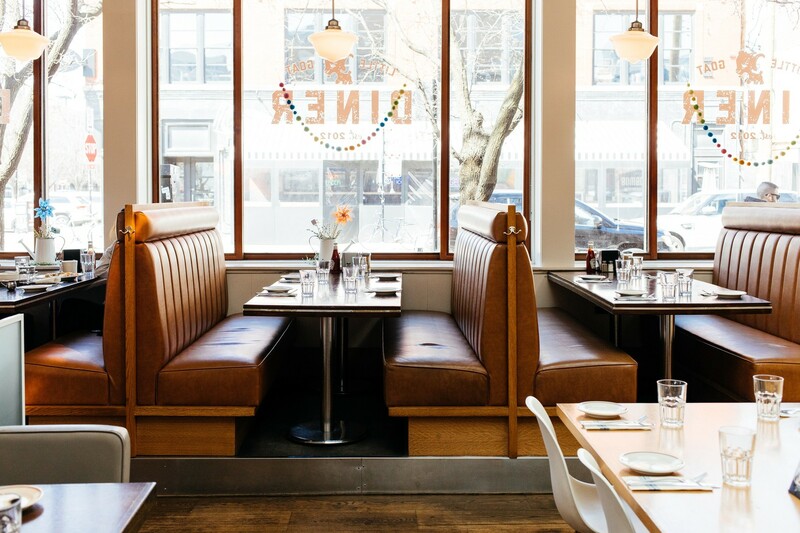 But Little Goat has the diner atmosphere down. There’s a counter with spinning stools, a ketchup bottle on every table, and a long laminated menu that says things like “blue plate special” and “breakfast all day.” The only thing that makes this different from your typical all-day spot serving breakfast, lunch, and dinner is the fact that you can make a reservation - which you should, if you don’t want to wait a while to sit down. The regular waits and general popularity of this place might make you assume the food is very good, and sometimes, it is. Little Goat does well with any combination that’s relatively simple. Like the Fat Elvis waffles: two waffles with peanut butter butter (yes, we meant to type “butter” twice), bananas, and maple syrup with bacon in it. The pancakes here are light, fluffy, and delicious, and the patty melt is sloppy and great. These are perfect hangover foods (not to mention ways to showcase why Chicago isn’t topping Forbes’ “Healthiest Cities” list anytime soon). But when there’s too much happening on a plate, we’re not fans. The breakfast dish “This Little Piggy Goes To China” has a lot going on - it’s a sesame cheddar biscuit with eggs, Sichuan sausage, gooseberries, and a chili garlic chive sauce. Individually those things are OK, but they just don’t taste good together. The same thing happens with the “Everything Is Everything Crumpets,” a lox plate involving everything-spiced crumpets, tzatziki cream cheese, and a salad made with fried eggs, sauce, capers, parsley, and sweet pickled onions. We get what they’re going for here, but it really just makes us miss regular old bagels and lox. And then there’s the Bullseye French toast (sweet onion brioche with a soft-cooked egg in the center, topped with fried chicken, strawberries, and BBQ maple syrup), which feels like three different breakfasts fighting each other. If you’re a fan of Girl & The Goat (or have watched Top Chef sometime in the past 10 years), you might go to Little Goat hoping for the same kind of great meal you’d get at the original spot. That’s not what you’ll find here, but that doesn’t mean there aren’t good reasons to come. For example, if you really just want breakfast for dinner - or other diner food that’s slightly more creative than what you’ll find at The Golden Nugget. Just avoid anything that sounds too convoluted, because chances are it probably is. The prototype for this dish might have been concocted with Eggos and Skippy after a night out. However it came about, the results are fantastic. And it turns out that peanut butter blended with actual butter is delicious. There are a few types of pancakes on the menu at Little Goat, and they’re all worth ordering. We’re big fans of these in particular - they’re topped with an oatmeal crumble and spiced apple slices. These tostadas (which come three to an order) are topped with grilled whitefish, then a huge mound of guacamole, pickled relish, cabbage, and queso fresco. They’re not bad, but you can’t really taste the actual fish under all the toppings. Think of this as Little Goat’s version of chilaquiles. It’s a cheddar omelette, topped with fresh masa chips, sour cream, tomato, and pickled peppers. The chips are thick and crispy, and the omelette is well-prepared. We’re big fans of this sandwich/burger hybrid. The house-baked rye is perfect, and we really like the addition of special sauce and gooey American cheese. If the Fat Elvis waffles taste like a drunk experiment gone right, this French toast is one that went wrong. The brioche is too sweet, we don’t like the combination of strawberries and eggs, or the combination of strawberries and fried chicken, or either of those things topped with a BBQ syrup. There’s a lot going on here, and it doesn’t work out very well. It’s a cheddar sesame biscuit, sunny-side up eggs, Sichuan sausage, gooseberries, and a sauce made with garlic, chili, and chives. Taste-wise everything gets muddled, and the sauce is also way too sweet. Our favorite thing about this is the lox, which is delicious. But the everything crumpets, tzatziki cream cheese, and egg salad (which is basically a very loose omelette piled with capers and parsley) don’t do much to complement each other, or the fish. The milk braised chicken is only available after 5pm, and that’s good because the less time people are exposed to this, the better. It’s a pasta dish made with gemelli noodles and chicken in a heavy cream sauce that’s very salty, and it’s one of the few straightforward menu items we don’t like. Skip it.